This week on ‘The Writing Life of:‘ I am thrilled to be interviewing author Kirstie Malone. Kirstie will be sharing with us detail of her writing life, telling us all about her latest book ‘Daisy Chain‘, which was released on 5th December 2017, and answering a few fun questions too. I’ve always wanted to do something creative so it went from cartoonist/artist to author and screenwriter. I loved Roald Dahl’s books, in particular Charlie & The Chocolate Factory. Also Jacqueline Wilson was another favourite of mine. I really enjoyed Tracy Beaker and The Illustrated Mum to name just a couple. I’m actually thinking of going back and reading some of my childhood favourites soon, just for a bit of fun. I was thirteen and after watching an episode of EastEnders I randomly decided to try writing an episode. I didn’t tell anyone I was doing it, thinking it would be the only time I would write a script, but when it was finished I had the feeling that it was what I’m meant to do. Looking back at that script makes me laugh as it’s so bad but I also love it because it gave me a direction in life from a fairly early age. I made sure I made time for writing as often as I possibly could and as soon as I left school and starting working, I also began sending my scripts off to TV production companies and competitions and applying for work experience placements within the industry. Five years after leaving school I managed to secure a place on an apprenticeship scheme at ITV and from there I moved to BBC Worldwide, allowing me to learn about the industry whilst spending evenings writing books and TV scripts. Once I had written my book I sent it off to publishers but it wasn’t what they were looking for so, last summer I decided to look into the self publishing option. I did a lot of research and found Spiffing Covers who, from start to finish, were really helpful, respectful and hard working. I will definitely be using them for my second book. Holding down my day job as a Production Coordinator at BBC Worldwide means its often difficult for me to be able to set aside specific writing hours, however I try to write for at least two hours each evening; whether its writing a short chapter or planning a scene in one of my scripts. Never. I understand why some well known authors do it but for me the aim was always to see my name on the front of a book. I’m not sure it would be considered a strange habit but the way I write is that once I have planned my characters, I will sit back and let them play scenes out in my head. It’s like I’m watching my very own drama! I’ll then write down what happened and edit it at a later date if needed. Always on a computer. I’ve never written a book or script using a typewriter but I would love to buy one and have a go. Daisy Chain is my first published book however I am working on my second book now and I also have a slate of eight TV drama series that I hope to get commissioned in the near future. A bit of both. I’m a plotter when it comes to character and the overall story structure but a pantser when it comes to actually writing the book or script. Now that Daisy Chain is out there it’s such a great feeling when someone tells me they have bought the book so I always make time to listen to their feedback and read any reviews. So far I haven’t had any negative comments which I’m really pleased about but even if I did, I wouldn’t take offence or think I’d done a bad job. Everyone’s taste in books is different and as long as my book gripped them enough for them to form some kind of opinion then I’m happy. I first had the idea eight years ago but in the early stages I planned for it to be a five part TV drama. After sending the script out to a long list of competitions and production companies, I enrolled in a home study diploma course in Creative Writing and as part of the course I had to write chapters of a book. The characters in Daisy Chain mean a lot to me and it felt important that they became known to others so I decided to turn the TV series into a book. It’s still a big dream of mine to have their stories adapted for TV in the future though! I didn’t spend a huge amount of time thinking of character names, they just seemed to pop into my head at the same time as their stories. A few things have changed over the years but their names have remained the same. I have five main characters in Daisy Chain. Karen appears to be the biggest success within the group – designer labels, movie star good looks, a flash car and a penthouse apartment – but underneath it all, she is incredibly lonely. She is the ex-childhood sweetheart of Jason and in fact, he is the first person in a long time she allows to see her with no make up on. Jason is quite a frustrating character as on the whole he is a really good guy but often ruins his own happiness by making stupid mistakes; often involving women. However once the group reunite it becomes clear that the only thing that could bring him true happiness again is reuniting with Karen. Veronica was once the life and soul of any party; loud, fun and vibrant with a smile that lit up the room. When the group reunites she is homeless and completely alone. I won’t say too much more about her as lots of twists and turns in the book reveal what happened to Veronica and what caused such a dramatic downfall. Bradley is academically the most successful one in the group. He stayed at University when everyone else left and has gone on to become a top doctor in a London hospital. He is, and always was, a kind, protective gentleman, particularly towards Karen. He is married to Danielle, six years his junior, but there marriage is tainted with its own issues and after reuniting with the group, the identity of his wife shocks his friends to the core. I don’t want to describe the scene in too much detail as its a huge moment in the story but there is a scene towards the end of the book that actually had me in tears as I was writing it. It’s the moment where the characters have to make their biggest and most important decision and readers may see a different side to a couple of the characters. It was so hard (and emotional) to write because these characters have been with me for eight years and it was effectively the scene that brought their story to an end. I’m a big fan of symbolism in writing and for me, a daisy chain perfectly sums up the five central characters and their bond. At the beginning their friendship was so strong, their bond seemed unbreakable to everyone else around them but over time it weakened until they all separated. A daisy chain can easily be fixed or re-created but the question here is, when they are brought back together, can Karen, Jason, Jessica, Bradley and Veronica fix their friendship as easily? I also gave Karen, Jessica and Veronica matching daisy chain tattoos around their wrists which they had done when they were teenagers. As we meet each of them, their tattoos are in different states; one is barely visible, one is slightly faded and the other is perfect. It represents where each of the women are in their lives at that point. 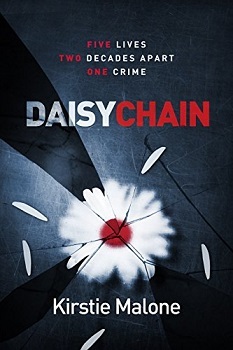 The first time someone read Daisy Chain was when I submitted it to the editor at the publishing company. I really wanted family and friends to experience the book as any other reader would so I kept it to myself until the point of publication. That’s also the reason I dedicated the book to my parents; they have always been desperate to read my work but I have always been quite secretive about it. Some people might have thought that perhaps this was a book that I would never get round to publishing but my parents always believed I would get there and this was my thank you to them. I did a lot of research to find the best self publishing company for my book and ended up working with Spiffing Covers. After meeting them I was able to put together my own publishing package based on what I thought was most important and what I wanted to get out of publishing my book. I’m really glad I went down the self publishing route as I was able to be in complete control and approve each stage of the process, rather than handing the manuscript over and not seeing anything until the finished book was printed. I actually can’t remember. Probably just chilled out and got a full nights sleep. Writing a novel alongside a busy full-time job is tiring! I’m about to start writing my second book. I won’t say too much about it as its still in the early stages but it’s an entirely different story to Daisy Chain. I felt like writing a sequel to Daisy Chain wouldn’t have worked. I’m pleased with how the story ended and don’t feel the need to drag it on for several books. I’m looking forward to getting stuck into the planning and research for the next book! Coat of Many Colours by Dolly Parton. A house of my own, away from the city, with an office where I can spend hours writing my next book or TV script. You can find out more about Kirstie Malone by visiting the website/social media sites below. I would like to say a big thank you to Kirstie Malone for sharing with us details of her writing life, and for a wonderful interview. I love your author interviews! You are the reason why I reached out to my favorite author for an interview and she said yes! Wow, brilliant. Who is your favourite author? Great interview. Daisy chain sounds interesting. What a great and insightful interview! Great job! I always love reading these interviews! Interesting interview. I’m glad to hear you play scenes in you head, too, when you’re writing what your characters are doing. haha Our own personal TV series. What a lovely interview, thank you for putting her books on my radar! Great interview! It would be fun being a cartoonist if I was talented enough! Great post and interview this is actually the first time I heard about this author and her book and Daisy Chain looks and sounds absolutely amazing and right up my alley to boot. Thank you so much for sharing your awesome post and putting this book and author on my radar.